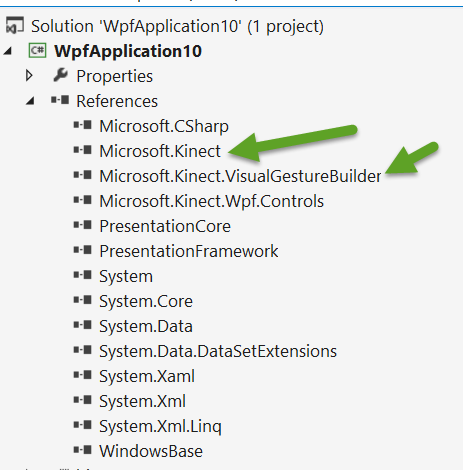 Following up on that previous post Kinect for Windows V2 SDK- Hello ‘Custom Gesture’ World where I’d made a basic training database containing a custom continuous gesture, I wanted to take the next step and have some of my own code respond to that gesture. 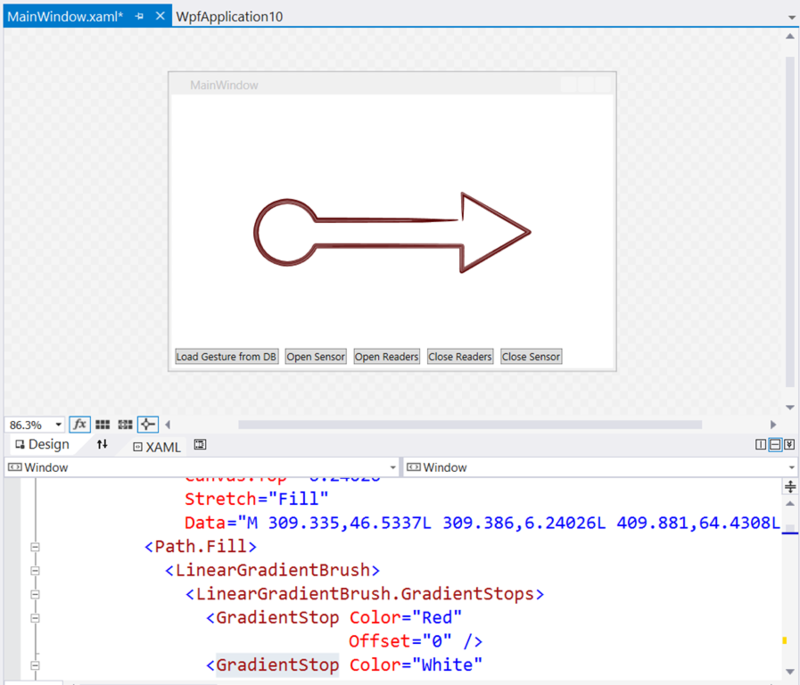 <Button Content="Load Gesture from DB"
With that little piece of UI in place, the next step is write code which loads up the .gbd file that the Visual Gesture Builder tool produced for me as part of the previous blog post and to have code which extracts the single gesture that resides in that file. Note that it’d be more usual to have a number of gestures in a database like this but I just have the one here. and made sure that Visual Studio was configured to copy that file into the output folder as part of the build process. and that’s all fairly standard although I should really be checking for sensor availability and changes in that availability but I haven’t done that here but it has featured in code in some of my previous posts. NB: this tracking id of 0 isn’t a valid tracking id as my code won’t have a valid tracking ID until tracked bodies start to arrive via the body frame reading code. For now, I pass 0. 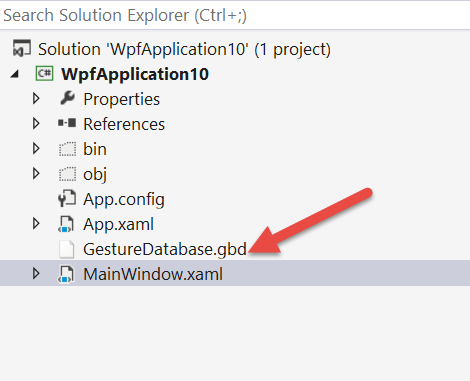 Telling the VisualGestureBuilderFrameSource about the gesture that I want to track – this is the gesture I populated from the database – via the AddGesture() call. Handling the TrackingIdLost event so that we know as/when the framework loses track of the id of the body that we have given it. 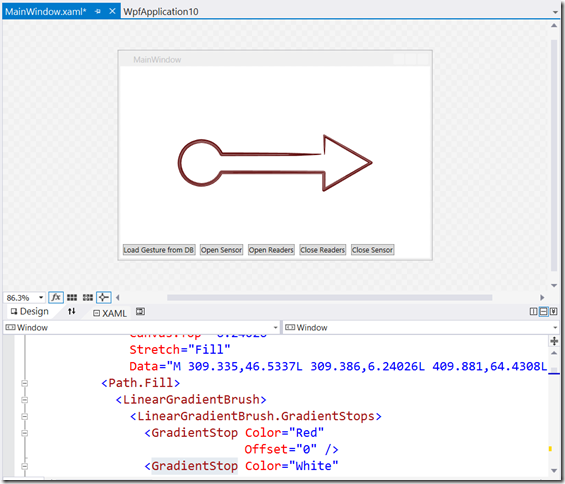 Opening up a VisualGestureBuilderFrameReader which returns frames of data as gestures are recognised. Pausing that reader until a real tracking ID arrives. Handling a FrameArrived event on that VisualGestureBuilderFrameReader in order to pick up the frames of data for recognised gestures as they come along. the key part of that code being that the TrackingId of the first body being reported as tracked by the sensor is fed through to the underlying VisualGestureBuilderFrameSource such that it is then tracking gestures on the right body. // we are in terms of progress of the gesture. Note that the code looks at the ContinuousGestureResults because my gesture is one that progresses from 0 to 1 rather than a discrete on/off gesture which resides in a different dictionary. 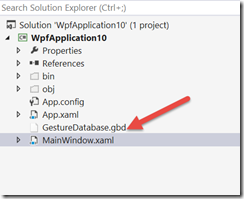 Open the gestures database & extract my gestures. Open the sensor and open up body readers and gesture readers. Wait for frames of gesture data to become available and check out the Progress value for any gestures that I’ve expressed interest in. which I think worked pretty well given that the gesture had so little training and, once again, hats off to the Kinect SDK people for making it so easy to load up one of these gestures and get back the data from it as it’s being tracked. I should add, I only worked with a single body in this post but it’s easily expandable out to the full 6 and the SDK sample does exactly that for a “seated” gesture. If you want the code for this – it’s here for download. Essentially, what you’re getting is a DirectoryNotFoundException “This API has returned an exception from an HRESULT: 0x80070003”. I puzzled over this for quite some time when I first hit it. I had no real clue which directory the underlying code might be looking for at this point where I had called VisualGestureBuilderFrameSource.AddGesture and I wondered if my .gdb file was corrupt. 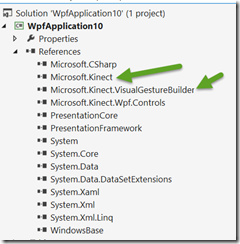 and then copy the vgbtechs folder ( which contains the 2 DLLs for the different algorithms for gesture detection ) into the output folder of my WPF project – i.e. and that solved the problem for me. I got that solution from this forum post but, as you can probably imagine, that was after a bit of searching and so I’m reproducing it here.